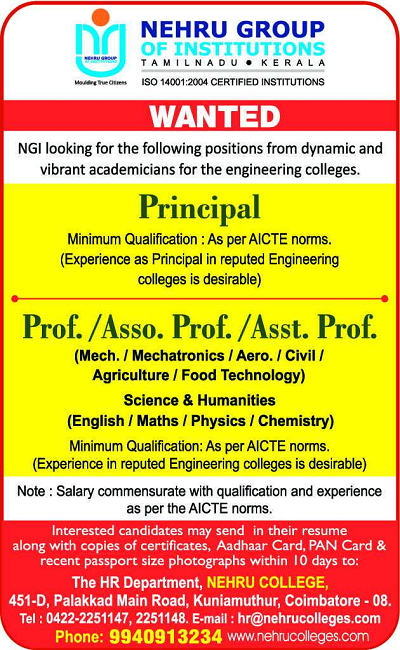 Nehru Group of Institutions, Coimbatore has advertised in THE HINDU newspaper for recruitment of Professor / Associate Professor / Assistant Professor / Principal jobs vacancies. Interested and eligible job aspirants are requested to apply within 10 days from 06th February 2019. Check out further more details below. College Profile: Nehru College of Engineering and Research Centre is located on the northern slopes of Thiruvilwamala, which merges into the banks of the holy river Nila (Bharathapuzha). This undulating terrain of 40 acres with lush green vegetation is continuously swept and hugged by the gentle northern breeze that bring the purity, serenity Mission : To mould our youngsters into Millennium leaders not only in Technological and Scientific fields but also to nurture and strengthen the innate goodness and humane nature in them, to equip them to face the future challenges in technological breakthroughs and information explosions. How to Apply: Interested and Eligible candidates may send their resume along with recent passport size photograph, copy of Aadhaar card, copy of PAN card and necessary documents to the HR department by Post or Email address within 10 days.